Aside from makeup, one of our most favourite beauty products is haircare. We're always looking for the next new thing or tips on how to style our hair in different ways so we've recently teamed up with Aussie to do exactly that. To celebrate the launch of the new Aussie 3 Minute Miracle Light Deep Treatment Mousse we'll be joining in on an #AussiePerfectMatch twitter chat to talk all about some haircare tips and tricks, plus the chance to win some lovely prizes! We've always been big fans of Aussie's 3 Minute Miracle deep conditioning treatments long before the blogging years which I'm sure you've all heard of but if you haven't heard about the new treatment mousses, there are two versions to choose from: Aussome Volume and Mega. They're two lightweight, rinse out mousses which help condition and nourish the hair without weighing it down so they're perfect for fine hair. To use you apply in the shower after your preferred Aussie shampoo & conditioner like you would a deep conditioning treatment and rinse out for some serious volume. It's quite hard to find products which condition the hair but also add an element of volume so it really does sound like a match made in heaven. Now for details on the twitter chat. The #AussiePerfectMatch chat will take place on Friday 21st of March between 12:30 - 1:30pm GMT in which Aussie Haircare Expert Liz Taw will be on hand to answer any hair related questions, for example: "How can I achieve more volume?" or "How can I fight frizz?" plus she'll be there to find your perfect hair match. 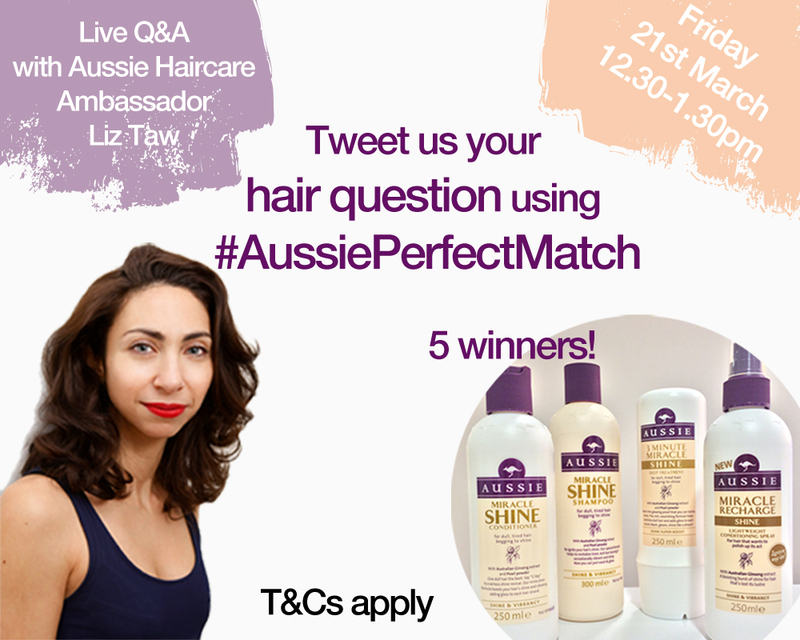 All you need to do is add the #AussiePerfectMatch hashtag to your question and you can follow @Aussie_Hair_UK during the chat. We'll also be tweeting and helping out during the chat with your questions (@lisaandsami) where we'll be joined by Pearls and Poodles (@PinkPixieDoll) and Em Talks (@emshelx) which should be really fun. Even if you're unable to make it to the chat when it's on, you can still tweet questions in advance using #AussiePerfectMatch so you won't miss out! Now for the most exciting part, in addition to learning new haircare tips and recommendations, Aussie (@Aussie_Hair_UK) will also be giving away 5 sets of Aussie products so you can find your perfect match. Make sure you submit a question and you'll have a chance of winning some lovely new hair care. Terms and conditions apply. We'll be looking forward to seeing you there on Friday 21st March at 12:30 - 1:30pm and as Aussie say : "There's more to life than hair, but it's a good place to start".